Haven't done much sewing this week. 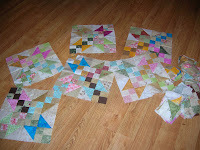 But I did find the 16 fat quarters needed for the swap we have planned. Now all I have to do is get them cut and bagged. But I don't need to have them until the June Thimbles session. Gretchen blogged about this quilt awhile ago. She was productive this past weekend by cleaning out her attic. What did I do??? I worked on this scrap quilt. I love scrap quilts although this one is not really scrap. It is made from fat quarters. I went trolling in the sewing room and came up with lots! Go figure. 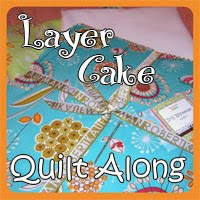 The quilt is featured on the cover of the June 2009 issue of American Patchwork and Quilting. The basic block is a Buckeye Beauty pattern but the sahing is also done scrappy. Sunday afternoon was spent on the couch watching the History channel-several programs on how the earth was formed or something. Plate technonics, etc. Although I must admit that I did some dozing! And now it is on to a short owrk week. I am heading to Florida on Thrs. and hanging out with Kathy. Becky has bloggers she follows on her site and now I see that Laurie does too. I would like to do this but when I went to the site-could not figure it out....and I didn't really feel like concentrating on it either...maybe tomorrow, Scarlet! 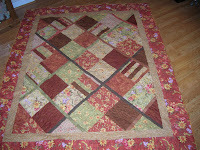 I decided this morning that I would put a block together on the Gretch made me do it quilt. It is not a difficult pattern but you could not prove it by the number of times I took the pieces apart. Finally I have one block done-24 to go. I am still working on the four patch units. I should have them done by the end of the weekend. But it is so beautiful outside today, I am feeling the need to veg in the sun (or in the shade). Got my tootsies done this morning-can't go walking in the sand with yucky feet...and they were bad. I didn't bother during the winter-who sees my toes then anyway?? I haven't blogged all week....nothing going on! I have been working on the top I started at Thimbles last weekend. I have completed all of the half square triangles. And when I counted them up, somewhere lost in the living room is one of them...so I just made another one! Then I started sewing to prepare for the 4 patch block. I need 200 of these bad boys. I have worked on them a little bit each night. Trying to stay awake in the early evening. As for the upcoming weekend....I guess I need to look at some clothes, etc along with the usual stuff. Next Thrs. I am heading off to Florida to spend some time with my friend Kathy. I sure hope the weather is nice because I am itching to put my feet in some sand. Yesterday was Thimbles and it was so good to see all of the quilty friends there. I decided to work on a quilt top that I blame on Gretchen. She blogged about it and I end up HAVING to do it! I got all 45 fat quarters cut into the appropriate pieces. Now I am working on making the half square triangles-the top calls for 296 of those bad boys. I will be cutting and pressing for awhile. Then I can work on the four patch sections. Basically the design is a variation of Buckeye Beauty. I wanted to sew some today but my sewing chair is not cooperating with my aching back. Also I need to think about the backing for the last top I completed using the Fresh pattern from Moda. I am planning on piecing the back using the same fabric line. But my brain is not functioning so it will probably have to wait! I think the couch is calling me! 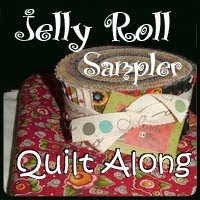 I was on a roll last year completing quilts. Not so much this year. I think this is only #4 to be completed. I love the fabric line. I got it out at Bad Melisa's of course. The pattern was an interesting one although I don't think I would do it again. As I remember the directions left a little to be desired. It is quilted with a sunflower design in a bright yellow thread. The backing is green-kind of a nature quilt! I was intrigued by Gretchen's last blog and sought out the magazines she talked about. 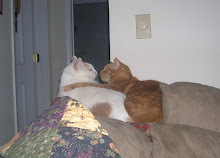 They were in a pile on the coffee table of course! 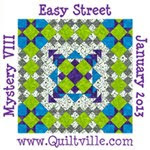 I am thinking about that scrappy one...I really like to make scrappy quilts. Must go look in the sewing room for some appropraite fabric! We spent Sunday afternoon together. Sarah and Emma's doll dresses fit fine except I had to move the velcro dots on the straps. Sarah put on her dress right away. This if the first dress I have made in at least 10 years! 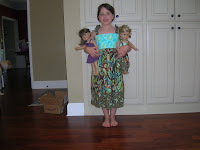 I used to make all of the firls dresses when they were little. But it is so hard to keep the seam allowance right. I am too used to quarter inch seams! Yesterday morning...Sarah's doll dress is made and i have the rest to go! I guess I work best under pressure. The second doll dress went together quickly and then on to tackling the little girls' dresses. I decided on a quick trip to JoAnn to see if I could find a pattern for Sarah's dress so that I would not have to deal with making buttonholes. I found a great pattern and it was on sale!! home again and on to cutting and sewing. I pretty much got them finished before 6PM. Now the girls and their dolls can dress alike! I will go over to see them this afternoon. I don't think it will be warm enough to wear the dresses today. Good news is that it is not raining and the wind is calm! Rain due in tomorrow. Glad to see this week is at an end.. I thought I would be able to leave work a little early yesterday..Friday is usually a slow day and devoted to cleaning up and finishing stuff. Well that didn't happen! Things pretty much fell apart about 11:30 with a medical emergency and never got much better. I was getting ready to head home shortly after 5 when Laurie called. Good news and bad news...her cold is better but she still is quite congested, she took Lilly to the vet and the dog is fine except for the accidents she has been having in the house this week-no UTI but some behavior issues. Long story short I headed over to her house and we would have supper together. We decided to go to Outback and headed toward Crossville Rd which is now the closest one to her house. We had a nice supper. They make a good chocolate martini there. She finished mine-guess I just wasn't in the mood....As we open the door to leave the restaurant....the warning sirens are going off. Cobb and Fulton counties have sirens they use for tornado warnings.....great tornadoes really freak me out. Laurie, on the other hand, is not phased by them. After listening to the radio, I decided I would just head home. I did beat the worst rain home. I heard some hale but no wind...thank goodness. But I needed to be home with the boys. Today my heart is still breaking. I came home from work on Monday to find my precious boy dead in the living room. He was fine when I went to work in the morning. I don't know what happened and am just so sad. I did not have him that long-probably about 5 years. 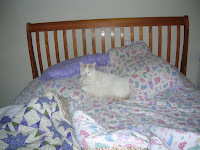 I got him when I went to buy catfood one Saturday at Petsmart and there was a rescue group there. He was a very sweet boy. Henry, Spooky and I are quite lost at the moment. Would you believe the above garment took me 2 hours to make. And it isn't reduced in size..it is a dress for Sarah's American Girl doll. 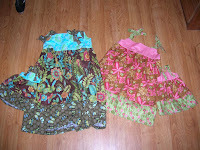 I have yet to tackle the dress for Emma's doll (same pattern, different fabrics) and the matching dresses for the girls. I hope the girl's dresses are easier! The pattern directions left a little to be desired, well a lot to be desired! It's a good thing that it got chilly again-I have afew days to finish them up. My friend Kathy emailed me to find out what is wrong...nothing. And that about sums it up. Go to work, come home, go to bed! We headed south on I85 and just before Ga400 feeds into 85, the traffic came to a screeching halt. For the next hour we crawled through town. A sign was being replaced by the Ga State village and 4 left lanes were closed on the connector! I hope Sue and family were not stuck in this mess. They were headed to Fla for spring break yesterday. Finally through we head toward Newnan. AND THEN the traffic again slows to a stop. When we got to the next exit we decided that it just wasn't worth it to sit in this mess as far as the eye could see, crawling cars. Headed back north and went to Jonesboro-Quilts n' Fixins. It is a nice shop. Haven't been there in awhile. They have rearranged some of their shelves and it is easier to walk around. Then we headed over to Scarlet Thread in McDonough. I knew Louise would like this shop (and she did). Then took more back road to Melisa and Sweet Home. I guess that these are now #1 and 2 as my favorite shops. Sweet Home is #1 of course. Then had to head over to Laurie's house to get the other garage door opener and then finally home. Quite the adventure...I was exhausted and had to lay down and I didn't even drive. This week-more of the same I guess. 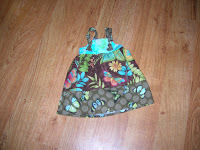 I am going to work on the little dresses for the girls' dolls this week. This instead of candy in an Easter basket. We will see how much I get accomplished! So that is it-another boring blog.